MGM Resorts has opened Delano Las Vegas, a boutique hotel, under Morgans Hotel Group's Delano brand. 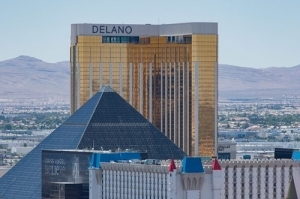 Located on the Las Vegas Strip, Delano Las Vegas is connected to Mandalay Bay Resort & Casino. It replaces the previous THEhotel which had operated at the same location. A number of boutique hotels have recently opened in Las Vegas. Delano Las Vegas appears to be an example of this continuing trend of development of themed boutique hotels in the area. Delano has over 1,100 rooms including dozens of penthouse suites. It incorporates some features of Delano's South Beach Hotel, which is famous for its style & art deco design. Delano Las Vegas focuses on personalized service. It provides an alternative to a casino gaming environment, and in fact, does not offer gaming facilities. Delano Las Vegas is non-smoking. It allows pets in some rooms. There are services for guests that bring their pets, including pet sitting. A significant part of the previous operation's clientele were business travelers. Delano Las Vegas is seeking to continue to serve this market. It hosts business meeting space on the hotel's roof with extensive views of the city, in addition to other amenities. The lobby area of Delano Las Vegas is designed with black, tan, brown, and dark shades. Near the lobby, water infused with various fruits and herbs is provided. Delano offers a number of different restaurants. Some of the types of food available include French & Italian styles, as well as comfort food. A restaurant called Della's Kitchen serves some dishes from ingredients sourced from the regional area. It seeks to serve business travelers that are Hotel guests. Delano has a sauna & steam room, in addition to many other luxury features. The facility will offer wedding events plans.